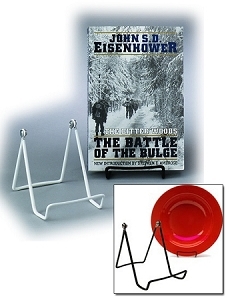 Model 6A - Wire display book easel is similar to the 2A display easel but with a deeper 1/2" lip that allows you to display your hard cover books or manuals. Constructed of durable vinyl coated steel wire. Machine-riveted for continuous firm tension, to allow easy hand-setting of desired angle.